In this post we take a look at how you can handle network requests in Android in order to protect yourself from UI changes. Read on for details! The reality of ever-changing design specs can, at times, be frustrating and miserable, but rather than focus on the negatives I like to think that it can also be a fun challenge in how we approach development. So today I am going to share one improvement I made on how I handle network requests in Android development to protect against UI changes. But if you wanted to update the UI to also show a user’s age and astrological sign you would also have to update the view interface. This update to the view interface is both frustrating and a violation of the Open-Closed Principle. Note: Before I continue talking about how annoying updating view interfaces can be, I want to admit that, just like everything else in life, there are pros and cons, and sometimes this sort of update is necessary and can even be good. But enough mature pragmatism, back to the bad. Another reason I find these sorts of updates frustrating is that they can take away from the bigger picture of what is happening in a given view and focus too much on the minute details of visual implementation. Now I know what you’re thinking, “but it’s a VIEW INTERFACE! It’s supposed to focus on the visuals!” And you would be correct, but before you get a bee in your bonnet consider that we do not yet have the full picture. So far in our example, we have only been focusing on the methods that handle displaying a User. Let’s look at the presenter, to see how it fetches the User to better understand the rest of what is happening with this view. Ah, good ole network calls. Because our User object is coming from a network call, we need to update our view interface to include methods for showing the various states surrounding making a request. Our view interface is starting to look a bit different. It’s not all about the User details anymore, it also has some networking view state stuff in there. As you can imagine, all view interfaces that work with a presenter that makes networking calls would also have to add these networking related view methods. That means a lot of duplication across all our view interfaces and no one wants that. Say hello to NetworkingViewState. A sealed class, Networking View State abstracts all the various states a view can be in, as a result of a networking call, into a single type. Now let’s update our view interface with this new type. Now if the UI changes, our view interface, our presenter, and our tests do not have to change because the bigger picture behavior remains the same. But we're not done yet. While we have made our code more SOLID (get it!?) we have also lost some test coverage. Before we introduced NetworkingViewState our presenter was in charge of mapping the User object we got in the response from the API into the appropriate types to be shown by the view interface. And because those formatted values were passed through the view interface we could assert they were the correct values in our tests. There is no validation around the User object being passed on to the success case. So how can we gain those formatting tests back? 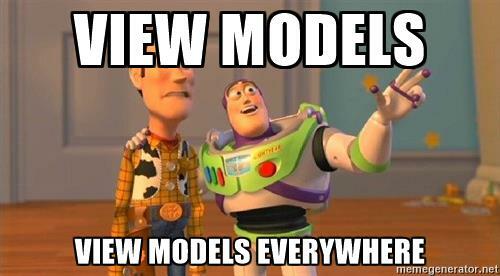 That’s right, view models! When we set the NetworkingViewState to Success in our presenter, rather than pass the User object we can pass a UserViewModel instead. And we can add tests for our UserViewModel in a separate class to ensure all values are formatted properly. val expected = "Amanda Hill"
Huzzah ! Test coverage regained! And blog post complete! Published at DZone with permission of Amanda Hill , DZone MVB. See the original article here.